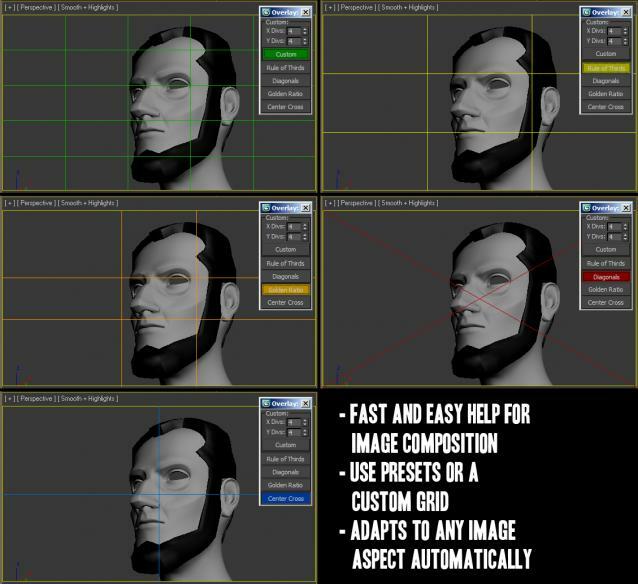 I wanted to create a script to visualize the `Rule of Thirds` inside the 3ds Max Viewport, to aid in the composition of my camera shots. Inspired by this script I also added some other overlay options. The lines inside the viewport are drawn as a kind of render effect, so no geometry is created and no camera is needed. They will interactively adjust to any image aspect and are visible in the active viewport, so switching the viewport will also move the lines there. Use the checkboxes to toggle each ones visibility. I use 3dsmaxdesign2013, and all the grid are blue regardless of choosen colors. Thanks for this nice scipt. I´m checking my compositions quite often with it. Very handy. 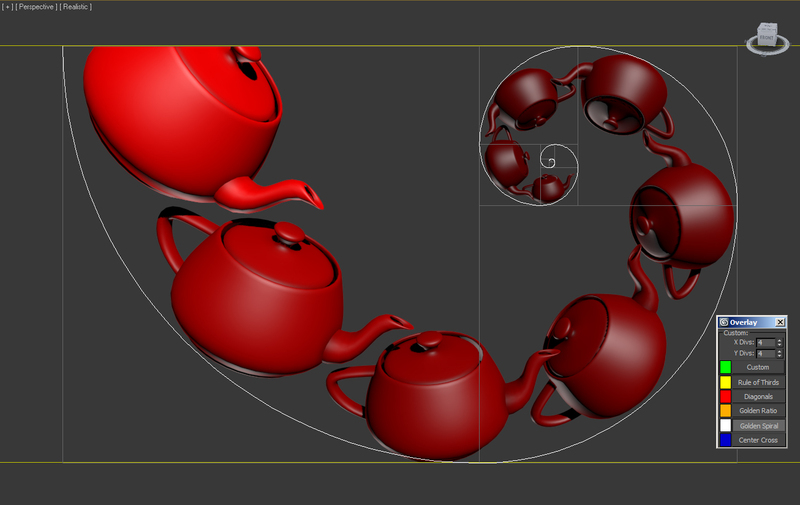 A small feature request would be harmonic/golden triangles and a possibility to override the fixed aspect ratio of the golden spiral to create “distorted” spirals. I’m having trouble placing this script into a toolbar. What should I be looking for Category wise? if you ever get to it – do you think its possible to make golden spiral switch between landscape/portrate CW/CCW? can you pls tell me how i create a button and add this script on it pls !! i am not able to find script in user interface so pls help me thanks !! Please show some print screen or step by step which line or code need to change or erase in order for to use as macroscript. Thanks a lot. Very usefull script ! thank you very much. But I have a question: how can i switch golden spirale between landscape and portrate ? Thanks, to flip just rightclick the golden spiral button. Nice useful script! Thanks for providing it. One little problem, the lines appear all blue in 3dsMax2013 and all white in 3dsMax2015.. Is there a way to make it show the original colors in the viewport? Thanks! That was may doubt too. Hm I havent checked for a while, but if it is broken again in more modern 3ds Max versions then there is most probably not much I can do. I will look into it, but no promises. How to make it button? To create a button with it you can use this other scrit that creates a button automaticlaly. I tried just adding macroscript, tooltip, category and change the extensuion to mcr like I normally do but it didn’t work. Hi very nice script and very useful. Can i use this inside RHINO and not 3dsmax? Is it something that it can be done? I mostly use RHINO in my workflow for 3D and renderings. No sorry, maxscript is only useful in 3ds Max. I don’t know if RHINO can be scripted, but someone would have to port the tool over then. Cool script. It would be very useful if the custom grids would stick to only camera views(or a defined viewport), even if I change the active viewport. Do you think it’s possible(easy-hard) to implement? Thanks for your scripts, efforts, really appreciated! Thanks for the script!!! Is there a possibility to make golden spiral in portrait mode? This script is just AWESOME!!! it also points me to the line 524 of the script. Do you know what is happenig?